It's always a treat to be able to share something near and dear to my heart with you. Today is one of those occasions. One of my dear friends, Marcela Camargo, has a shop on etsy that I just adore. Tea Accessories offers gorgeous necklaces, headbands, and accessories. I've known Marcela for about 15 years. She is smart, motivated, and I'm so impressed by her creativity. Originally from Mexico, Marcela has studied in the United States and the United Kingdom, and now resides in Michigan. Marcela recently made these adorable shirts for the minnies. They kind of remind me of a shirt that crewcuts would offer in their collection. This shirt is so practical because the flowers snap on and off, making it easy to wash. She also has another variation of this shirt as a onesie for a baby! What an adorable baby gift. This headband is one of my favorite things that Marcela has in her store right now. Feel free to message her for custom items. 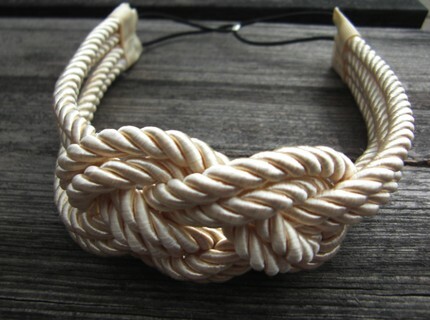 Ivory Sailor Knot Headband: Perfect for a nautical inspired outfit. Here's a funny story. When we were both MUCH younger, Marcela and I fit so many girls in my little tiny car and made our trek to the "good mall" in Northern Virginia, Tysons Corner. We bought so much on that day, being the good mini-shoppers, that between all of us and our bags, we hardly fit in the car on the way home. It was such a fun day and I have many happy memories of time spent with her. You can also follow Marcela on her facebook page, Tea Accessories. She just went to Paris and told me that she was inspired by so many pieces that she saw there. Happy Socialite Saturday, a phrase borrowed from my friend, Beth Dunn. It's been a very long week. That headband is so cute! Perfect for going out sailing. You can look cute & keep the wind out of your face! I'm not a headband girl but that one is fantastic! As is her shirt!